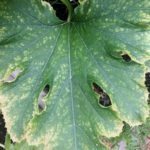 Japanese beetles can strip the foliage from your prized plants in no time. To add insult to injury, their larvae feed on grass roots, leaving ugly, brown dead spots in the lawn. 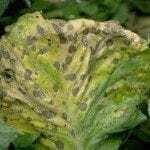 The adult beetles are tough and difficult to kill, but their larvae are susceptible to several biological controls, including milky spore disease. 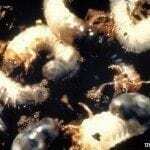 Let’s learn more about using milky spore for lawns and gardens to control these grubs. Long before horticulturalists coined the terms “integrated pest management” and “biological controls,” the bacterium Paenibacillus papillae, commonly called milky spore, was commercially available to control Japanese beetle larvae, or grub worms. Although it isn’t new, it is still considered one of the best methods of control for Japanese beetles. 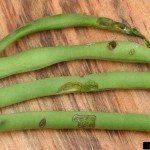 After the larvae eat the bacteria, their body fluids turn milky and they die, releasing more of the bacterial spores into the soil. Japanese beetle larvae are the only organisms known to be susceptible to the disease, and as long as they are present in the soil, the bacterium increases in numbers. The bacteria remain in the soil for two to ten years. When using milky spore for lawns, it can take three years to achieve control of the insect in warm climates, and even longer in cooler areas. You can also use milky spore in vegetable gardens without fear of crop damage or contamination. Ideal soil temperatures for using milky spore are between 60 and 70 F. (15-21 C.). The best time of year to use the product is fall, when the grubs are feeding aggressively. Although the grubs are in the soil year round, it only works when they are actively feeding. Knowing how to apply milky spore is important for effective control. Place a teaspoon of milky spore powder on the lawn, spacing the applications about four feet apart to form a grid. Don’t spread or spray the powder. Water it in with a gentle spray from a hose for about 15 minutes. Once the powder is watered in, you can safely mow or walk on the lawn. One application is all it takes. Milky spore won’t completely eliminate Japanese beetle grubs from your lawn, but it will keep their numbers below the damage threshold, which is about 10 to 12 grubs per square foot. Although Japanese beetles can fly in from your neighbor’s lawn, they will be few in number. Japanese beetles only feed for two weeks, and visiting beetles will be unable to reproduce in your lawn. 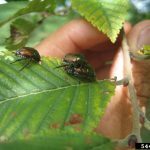 Milky spore disease is specific for Japanese beetles and it won’t harm humans, other animals or plants. 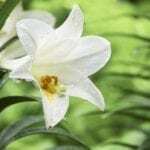 It is safe to use on lawn and ornamental plants as well as vegetable gardens. There is no risk of contamination due to runoff into bodies of water, and you can use it near wells.